The Console gives you the ability to restrict agents holding the CCP Agent or CCP Agent – Update Only role to managing a limited set of user profiles; for example, you could give an agent access only to profiles from users who live in Oregon. This is done by modifying the API client settings user_distinguisher_field and user_distinguisher_field_values. Note. The user_distinguisher_field and user_distinguisher_field_values settings are configured per entity type. That means that the preceding names apply only to the user entity type. For example, suppose you have an entity type named customers. In that case, the setting names would be customers_distinguisher_field and customer_distinguisher_field_values. For the sake of simplicity, this discussion will refer to user_distinguisher_field and user_distinguisher_field_values. Just remember that those names apply only to the user entity type. You can only limit access based on the value of a single attribute. For example, you can limit an agent to accessing profiles from a specific city by setting the user_distinguisher_field setting to primaryAddress.city. Alternatively, you can limit an agent to accessing profiles from a specific state by setting the user_distinguisher_field setting to primaryAddress.stateAbbreviation. But how do you limit access to a particular city in a particular state (for example, allowing an agent to access profiles from Portland, OR but not from Portland, ME)? You can’t: you can limit access to a city or to a state (one attribute), but you cannot limit access to a city and a state (multiple attributes). The attribute specified in the user_distinguisher_field setting must be an indexed attribute; if it’s not, the agent won’t have access to any profiles. If you want to, say, limit access to a particular state, then make sure you index the primaryAddress.stateAbbreviation attribute before doing so. The user_distinguisher_field applies to all API clients that are associated with the user entity type. If you decide to restrict authorization based on country, then that restriction is applied to all API clients for the user entity type. You cannot restrict authorization by country for Client A, then restrict authorization based on city or state for Client B (assuming that both clients are associated with the same entity type). However, you can configure different settings for clients that are based on different entity types. Suppose Client A employs the user entity type while Client B employs a different entity type, one named customers. 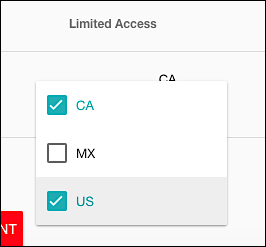 Because user restrictions are set on a per-entity type basis, you can set Client A to filter users by country and Client B to filter users by state. The net result? The two clients will filter on different attributes. However, this happens only because the two clients do not share an entity type. If you added the customers entity type to Client A, then – for that entity type – both clients will have to filter on the same attribute. From any page in the Console, click Manage Application. From the Manage Application page, click Edit Settings. On the Edit Settings page, click the Add Settings icon to add a new, blank setting. Click Select settings key and then, from the dropdown list, select the distinguisher_field setting for the desired entity type (for example, user_distinguisher_field). In the Value field, select the schema attribute you want to use for restricting acces (for example, primaryAddress.country). Click Save Changes to add the new setting. The value entered for the user_distinguisher_field_values setting must be exact matches for the values stored in the database. Note. Suppose you limit an agent to the four countries shown in the preceding example. Now, suppose you get a new set of user profiles for Italy, a country not listed in the user_distinguisher_field_values setting. Will the agent have access to these new profiles? Click Select settings key and then, from the dropdown list, select the distinguisher_field_values setting for the desired entity type (for example, user_distinguisher_field_values). In the Values field, enter the values you want to use as distinguishers. If you later decide to give this agent access to all the user profiles, just click the agent’s name on the Manage Agents page and then, on the Edit Agent page, change their access permissions to Full Access.